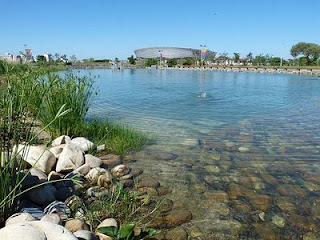 I went walkabout in the recently opened biodiversity park in Green Point last week. The intention was to create a calming, cool, green place for people in the middle of the city. They got it right. I must admit I could have done without the helicopter from 07.00 the morning on a local public holiday filming Denzel Washington and Ryan Reynolds over and over and over and over again. They had to come really low to film so you can imagine just how noisy it was. Why do these guys need to film one scene trillions of times? But OK they’ve gone now. The park is 12.5 hectares in size and has walkways, a cycle lane around the perimeter, seating and ponds. There are boards with information on indigenous plants, medicinal plants, edible plants and biodiversity. They have cute little hand crafted beaded creatures and animal silhouettes from old rusted metal. The park is a work in progress. An educational centre to train people in the practice of diversity is on the cards. It is irrigated using spring water from the Oranjezicht spring which is channeled into a canal and then re-used. Don’t forget that in close proximity to the park are the Metropolitan Golf course, Mouille Point Lighthouse, the beach, a couple of museums including the medical and navy museum. And of course the V and A Waterfront. On the other side of the park is trendy Green Point. The main road which runs next to the park has cafes, restaurants and bars galore. It’s a nice walking day trip. Great experience and we love the beaded animals!